Newlyweds Fabiana and Cody Philpott share their love of hand-drawn art with their business. The pair opened Lake Country’s only tattoo shop, NSI Tattoo, located off of Highway 97 off near the Dairy Queen. They focus on a traditional style of tattoos, with bold lines and bright colours, “things that will last forever,” Fabiana said. Coming from the small community of Vanderhoof, Cody enjoys the quaintness of Lake Country with the accessibility of Kelowna. “I like the small community feel that this place has,” he said. Fabiana is from Brazil. She started her artistic career in fashion and textiles before moving into tattoos. She took classes in Japanese style paintings which evolved into a tattoo career. “I actually met Fabiana through Instagram while I was in Japan. She got tattooed by the same guy who did all my tattoos in Japan,” Cody said. After two years of admiring each other’s work online, they met in Mexico. After getting married in Brazil the pair moved to Canada. Cody’s tattooing passion started with the Japanese artist who designed his tattoos, which stretch across his back and side. Graphic design and other forms of art can now be done online, but there’s something about having to do the art by hand which draws Cody to the art form. 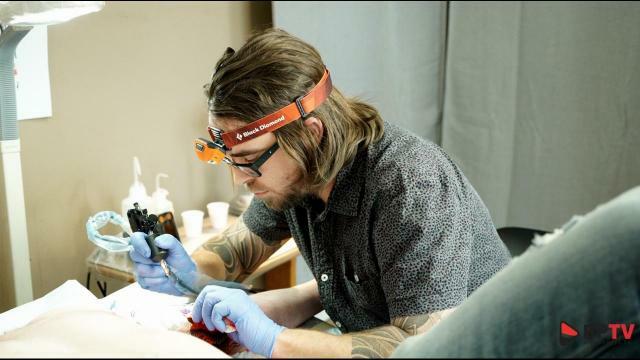 “With tattooing, it doesn’t matter about equipment as much, it’s still art by hand. There’s no robot yet that’s taken over this field,” he said. There’s a history to the art form, with rules that have to be followed, Fabiana said. NSI Tattoo is holding a Christmas flash sale, Dec. 2 and 3 and is be accepting walk-ins. Store hours are from Tuesday to Saturday, 10 a.m. to 6 p.m. The shop also offers tattoo ideas, for those who are unsure of what they want to get, Cody said. Cody said it’s easier to get a tattoo in the in the winter because it gives the tattoo time to heal.